Home Angel Locsin Angel Locsin Best Actress Awards awards Awards Night Best Actress Facebook Facebook Fan Page FAMAS Awards Night FB My Angel Locsin's FAMAS Best Actress Write-Up is Most Liked in Facebook! My Angel Locsin's FAMAS Best Actress Write-Up is Most Liked in Facebook! Ms. Angel Locsin just won the Best Actress Award in the recently concluded 61st FAMAS Awards held in the AFP Theater, Quezon City, April 21, 2013. I was not able to attend the said awards night due to other commitment and failed to see again my counterpart Angel Locsin. 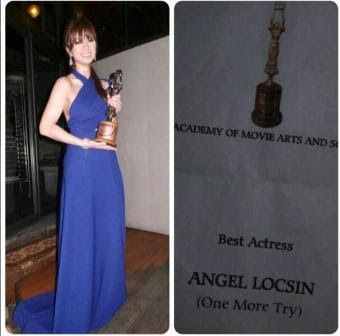 But then, right after the announcement of winners, I wrote a new article for Angel sharing her new winning moments for their blockbuster 2012 MMFF movie "One More Try." I posted the said article on my entertainment blog site TV Series Craze. 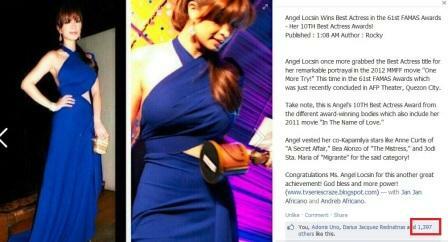 And it was shared by Angel's Official Facebook Fan Page. Upon sharing, the said post immediately got many Shares and Likes in the social media site. Angel's latest victory as Best Actress in the FAMAS Awards was actually her 10TH Best Actress trophy from the different award-giving bodies! Great one! That said post and response from the netizens were another proofs that many people were truly loving and supporting Angel. And of course, it is another concrete proof that she is the brightest star in her and in this generation!